I like cooking for my friends. They’re a good bunch of folks who know that at any given time, they may be subject to testing a new recipe that I’m trying. It’s kind of an understanding that we have – I gladly cook but new recipes may or may not work as planned. Convict me for the sin of Pride but I don’t want people to think I’m a bad cook when the reality may be a bad recipe so I try and stick to a rule of not making untested recipes for people who have never had my cooking. Yet, I unknowingly walked into that very situation during this cake quest. The Mistah and I had been invited to dinner with friends who have gladly tested my recipes in the past. I was looking for a reason to test yet another cake and figured I’d found tasters, so I said we’d bring dessert. Little did I know that there would be eight other guests in addition to us, and that this was a combined birthday celebration for three of them. Talk about pressure. I’m glad I didn’t know that as I was baking and frosting. 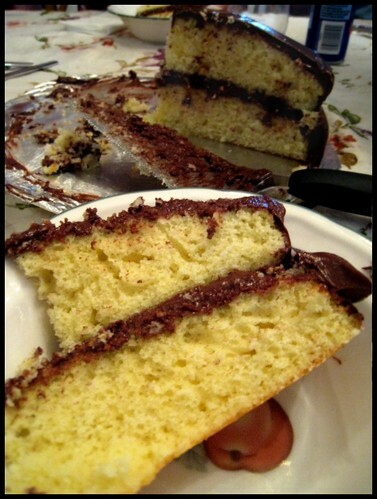 I had seen this cake on an episode of America’s Test Kitchen and promptly went online for the recipe. I had a sense from watching the show that this cake was going to be fussy with melting butter and whipping egg whites but I decided I was up to the challenge. Even though fast, easy dishes are what I like best, I’m not going to lie, I get a real sense of accomplishment from getting a more challenging recipe to work. If the result is good, I don’t mind working to get it. So after dinner, the time came to serve the cake. To people who mostly didn’t know that I can rock a recipe. The worst case scenario would be if it only got a polite comment or no comment at all. Best case would involve lots of lip smacking and fork licking. The reality was that I barely had a chance to snap the less than beautiful picture above because the cake was a hit. With EVERYONE. Forks were licked, plates were cleaned, and there was all around yumming. I have not gotten over my anxiety of cooking for new people. But I think I have come to the end of round 1 of the cake quest. This recipe gave me everything I wanted but thought I’d never find – moist cake, soft frosting, lots of flavor, no freakishly artificial ingredients, and a huge sense of accomplishment. Makes two 9 inch cake layers. Heat oven to 350 degrees. Grease two 9 inch round cake pans, line bottoms with parchment paper, grease parchment rounds, and dust pans with flour, shaking out any excess. Whisk flour, baking powder, baking soda, salt, and 1 1/2 cups sugar together in a large bowl. Whisk together the melted butter, buttermilk, oil, vanilla, and egg yolks in a medium bowl. In the bowl of a stand mixer fitted with a whisk attachment, beat egg whites at medium high speed until foamy, about 30 seconds. With machine running, gradually add remaining 1/4 cup sugar; continue to beat until stiff peaks just form (ATK says this should take 30 to 60 seconds but mine took something more like 2 minutes). The whites will hold a peak but appear moist. Transfer whites to a separate bowl and set aside. In the now empty mixing bowl, add flour mixture. Still using the whisk attachment, gradually pour in butter mixture and mix on low speed for about 15 seconds, until almost incorporated. Stop mixer and scrape down whisk and sides of bowl. Return mixer to medium low speed and beat for approximately 15 seconds until smooth and fully incorporated. Using a rubber spatula, stir 1/3 of whites into the batter. Add remaining whites and gently fold into batter until no white streaks remain. Divide the batter evenly between the prepared pans. Lightly tap the pans against your table or counter 2 to 3 times to dislodge any large air bubbles. Bake 20 to 22 minutes, until cake begin to pull away from the sides of pans and a toothpick inserted in the centers come out clean. Cool cakes in the pans on a wire rack for 10 minutes then invert cakes onto a wire rack and remove parchment. Invert cakes again and cool completely on rack, about 1 1/2 hours. The recipe says that the frosting can be made up to three hours in advance. For longer storage, refrigerate the frosting, covered, and let it stand at room temperature for one hour before using. Add butter, sugar, cocoa, and salt to the bowl of a food processor. Process about 30 seconds, until smooth. Scrape down sides of the bowl. Add corn syrup and vanilla and process until just combined, 5 to 10 seconds. Scrape sides of bowl. Add chocolate and pulse until smooth and creamy, 10 to 15 seconds. Frosting can be used immediately. Yellow cake with chocolate frosting is Miss D’s favorite. Can you bake this cake for her, because I am too lame to do it? TKW, after reading your post this morning I wish I could deliver this cake, or a plate of fried shrimp, to you personally. I highly recommend this one Tracy. Definitely saving this one. I need a good yellow cake recipe and this looks great! Karen, please do make this cake. The recipe is a little fussy, what with the egg whites and all, and you should plan on getting every single bowl you own dirty. But the results are definitely worth the effort. Beth, hope I didn’t freak y’all out the way I materialized out of thin air. After dinner we made our way back around the square, got some dessert, and headed home. My pictures didn’t turn out too well. Hope you had better results capturing the magic of the leg lamp. You should want this cake. And this frosting. Maybe especially the frosting once you see how easy and good it is. I only wish I could find a white frosting equivalent. I think I got a few good ones, but I need to get them off the camera to be sure. That’s the beauty of the tripod! Although people acted all funny around it–ducking out of pictures and apologizing, even when I was clearly not taking a picture! I need cake. But sadly it will have to wait until my life is a little less crazy with cookies. I wanted to buy cookies last night at Vaccaros and Noel gave me the “are you crazy” look. Classic. So where did you end up eating? It looked like you had poked your head in Nacho Mammas but then I got engrossed in a plate of fries. I think I have developed a raging case of ADD as an adult. After we left dinner I said to Jay, why don’t we stop at Vaccaros and get some dessert. He said, nah I can stop there whenever I want. Clearly, the man did not understand that it was not a question. He also thought I was suggesting that we go to Little Italy on the way home and was surprised when he saw the shop on the corner. Cream puff and a cannoli were promptly bought and devoured. I think this could be a Happy New Year cake. We ended up getting carry out from the kabob place. We did stick our head in at Nacho Mama’s and heard 35-45 minutes and quickly backed out. Someone might have been hurt if I had to wait that long just to sit down! We also checked out the other restaurants on that side and they had similar waits. Boo! So take out kabobs it was. I really wanted pizelles from Vaccaros. I didn’t get them because of the look. But I do drive through there like twice a day, so I should just stop and get them! (Hoping Noel doesn’t read this) Just pay cash so there will be no trail. and make sure I have the mini dyson in the car so I can vacuum immediately after I consume the whole bag! Bad enough I wanted the cake, then I read the posts and now I really want Vaccaros. I am glad you had success with the cake. I have their cookbook and the chocolate chip cookies are about the worst I have ever had. I am not, however, known to “rock” many recipes! Lara would it lessen your Vaccaro’s craving to know that the cream puff was dry? It really was. Sometimes I rock a recipe but I fail just as often. No lie.